The seas to the north of the Eastern Darklands are perilous and filled with danger. Most vessels stick close to the well charted, and guarded, shipping lanes, where the risks are greatly reduced. Few vessels will risk venturing out in to the deeper, unpatrolled waters - even the most seasoned Nocturnian Sea Captain will speak in hushed tones when talking of the ancient beasts that lie hidden within the deep cold waters in this part of the world. For those hoping to reduce the time at sea by travelling along a more direct route closer to the coast, the dangers of uncharted reefs and unpredicatble storms and currents dragging ships against the sheer cliff faces are ever present. Even the versatile Kaliphlinian Merchantmen find difficulty in negotiating these currents, and the jagged rocks would tear a hole in the hull of even the mightiest Avalonian Frigate. The only sailors bold, or reckless, enough to risk such perils are Mitgardian mariners. Their longboats and longships lie shallow in the water, reducing the risk of damage by reef, and their manouverability by use of both sail and oar power gives them an advantage when negotiating the currents. While Mitgardia does not endorse the infrequent raids in to the lands of Nocturnus conducted by some of the rogue elements of her lands, the raids have been a source of diplomatic tension between the two empires. For this reason, watch towers were set up along the Old Coast Road between Nocturnus and Mitgardia. These watchtowers allow the guards to report on the movement of vessels outside of the normal trading lanes, and to allow local villages time to take precautionary measures should a raid be suspected. The watchtowers also serve as a place for legitimate traders and travellers, from all empires, to rest and resupply when traversing the Old Coast Road. 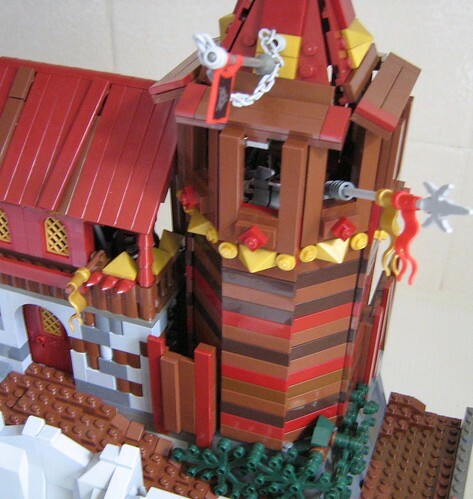 The following is an example of one of the watchtowers built along the imposing northern cliff face of the Nocturnian coast. Very nice, big fan of dark red myself !! Nice detail in the loose roof plank too. This might be a little to clean and welcoming for Nocturnus. Good Build. 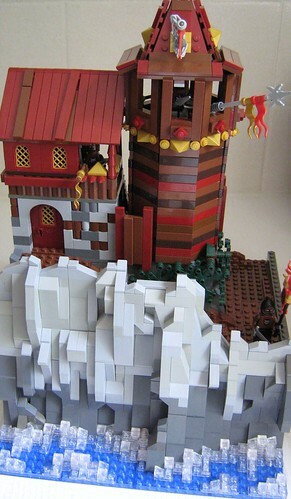 Really good build; the mix of browns and dark red looks great! Really lovely tower. Love the colours and the little steps to get into the tower itself. I also love the scene with the rocks and water. I love the colour scheme. There are some lovely grey towers out there, but this is simply lovely and original. Nocturnia is not only full of monsters. The rocks and the water really look excellent, and you've contained plenty here on a functional basis. 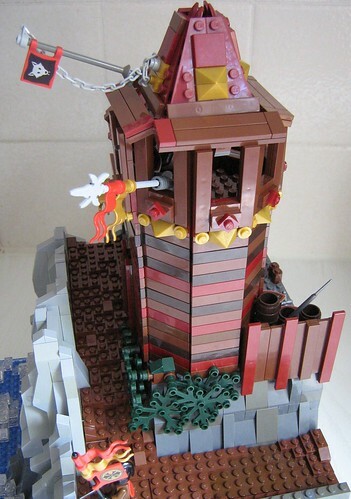 I wouldn't mind a transfer to this watchtower, but I imagine the wind would get pretty intense at times. Another great work from the Best Guild! I am glad to see how Mitgadrian frontiers are well guarded. 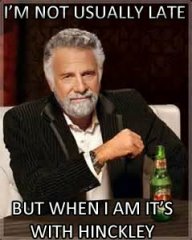 Yes, people seem to extrapolate our way of life. 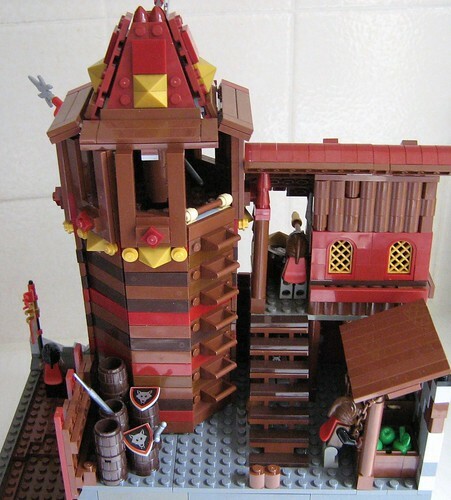 I think that even though it is a fantastic watchtower, it looks a little...well...to...nice for Nocturnus. I know that is stereotyping, but I think It would look better if it was more gloomy. I really like the colours used, and the loose plank on the roof adds character to the build. Both the staircase and the steps are nicely done, and I love how you've added atmosphere to the scene with the rough waves of the sea.